692 pages | 87 B/W Illus. This comprehensive reference offers an authoritative overview of Andean lifeways. It provides valuable historical context, and demonstrates the relevance of learning about the Andes in light of contemporary events and debates. The volume covers the ecology and pre-Columbian history of the region, and addresses key themes such as cosmology, aesthetics, gender and household relations, modes of economic production, exchange, and consumption, postcolonial legacies, identities, political organization and movements, and transnational interconnections. 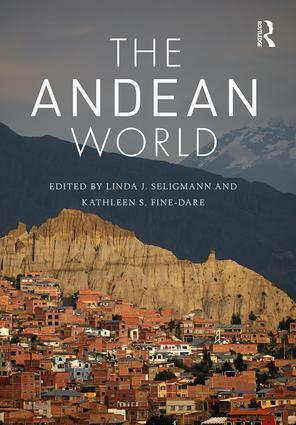 With over 40 essays by expert contributors that highlight the breadth and depth of Andean worlds, this is an essential resource for students and scholars alike. "Compiled by two leading authorities on Andean societies and cultures, The Andean World provides a uniquely accessible yet comprehensive overview of the many different experiences, voices, movements, and histories that have shaped life in the Andean highlands of Peru, Ecuador, and Bolivia.Together thevolume’s 42 lively chapters give the reader a rich, multidisciplinary introduction to the region." "This carefully edited work is different from others on the Andes. Combining chronological and thematic analyses, its coverage includes previously undertreated topics. Contributions from both experienced and emerging scholars, from a wide variety of disciplines, are combined to positive effect." Linda J. Seligmann is Professor of Anthropology at George Mason University, USA. Her most recent book is Broken Links, Enduring Ties: American Adoption across Race, Class, and Nation (2013). Kathleen S. Fine-Dare is Professor of Anthropology and Gender & Women's Studies at Fort Lewis College, USA. Her most recent book is Border Crossings: Transnational Americanist Anthropology (2009). The Routledge Worlds are magisterial surveys of key historical epochs, edited and written by world-renowned experts. Giving unprecedented breadth and depth of coverage, they are the works against which all future books on their subjects will be judged and are essential reading for anyone with a serious interest in the subject.